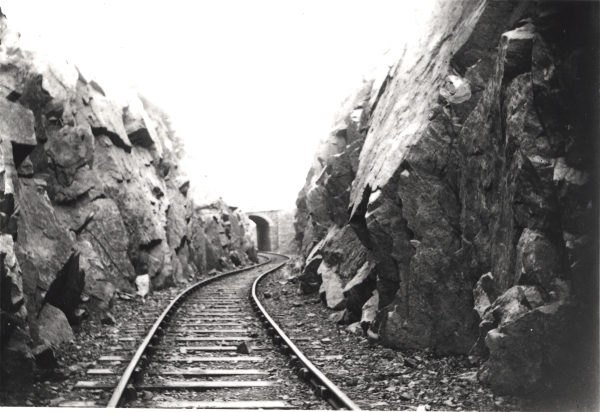 The Mountsorrel Railway was an industrial line built to serve local granite quarries in and around Mountsorrel. Championed by Earl Lanesborough, the first section opened in 1860 and connected Mountsorrel with the Midland Railway main line near to Barrow-upon-Soar. In 1896 the line was extended south-west to Swithland, to carry the ballast required during construction of the GCR itself. The line could have taken an easier route avoiding Nunckley Hill, however, being in the business of quarrying granite, a route straight through Nunckley Hill was chosen. When the GCR opened in 1898, the Mountsorrel Railway formed a link line between the two Leicester-Loughborough main lines, but it gradually fell out of use. The last recorded revenue earning train to run from the quarry to Swithland was in 1953, and by the 1960s much of the track had been lifted. 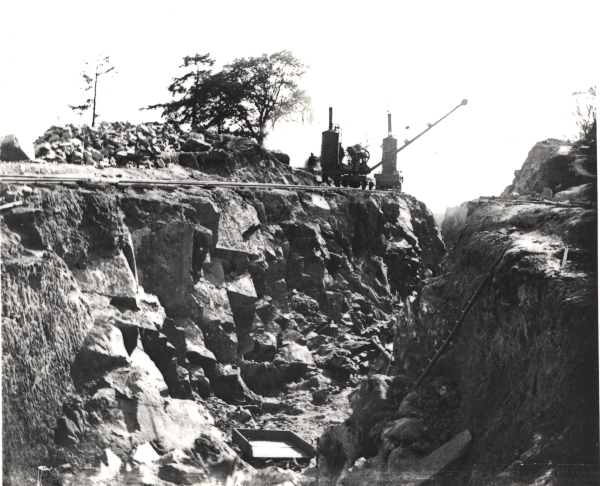 The granite quarry remained open and in 1976 the section to Barrow was replaced by a conveyor belt system taking the stone to a network of sidings next to the main line at Barrow-upon-soar. Over the next 50 years, the western section of the branch totally disappeared under trees and vegetation, and few people realised it had ever existed. In 2005 Railway Vehicle Preservations (RVP), needing a site on which to build a carriage shed, secured a lease covering a three-quarter mile section of the trackbed. Over the next few years the planning application for the engine shed stalled. The following weekend a team of just six volunteers set about the major task of clearing the vegetation. Things snowballed! The scheme captured local imaginations and families got involved with their children, not because they were railway enthusiasts but because of their interest in the village and its history. The ‘Mountsorrel Railway Project’ was born. 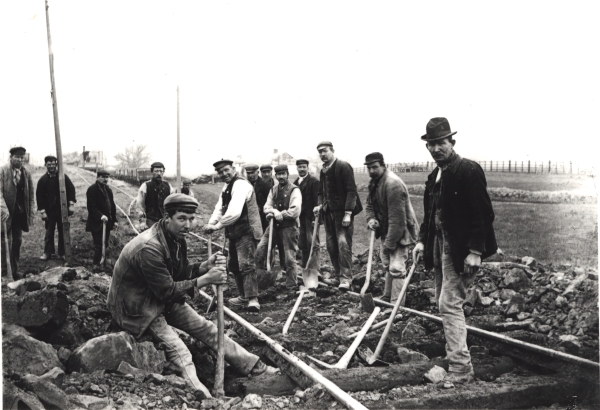 Working with hand-tools clearing the trackbed took over a year to complete. Always conscious of the impact of the restoration on local wildlife extensive advice was taken from Natural England. Track laying started in May 2010 and included a new junction point from the GCR’s up loop at Swithland sidings, together with a catch point. By early May 2011, the line had reached 328 yards (about a sixth of the total distance) and the first train over the line since it was lifted, a diesel-hauled rake of hoppers for a ballast drop, ran on May 16. The project still had sufficient rail to lay a further 492 yards of track, but needed £16,000 to buy sleepers and fittings for the next phase of track laying. By mid-2011 that sum had been raised, mostly from public donations, enabling a mid-November start on the extension towards Mountsorrel. By July 2012 the length of re-laid line was up to half a mile and a donation of track had been secured to take the line to Mountsorrel. December 2012 saw the line reach the bridge at Wood Lane, and by February 2013 track laying halted just short of Bond Lane, leaving space to build the platform. On November 23rd 2013 the first steam passenger train ran on the Mountsorrel Railway as far as Nunckley Hill. Completion of the platform at Mountsorrel in March 2015 saw the final sections of track laid and the sand drag installed at the end of the line. A further sand drag was installed in October 2015 at the Swithland end of the branch to enable a public service to commence. The first public service along the length of the branch took place on the 24th and 25th October 2015 for one weekend only. In 2016 we had two further running weekends, the 20th and 21st August and the 22nd and 23rd October, and four train weekends in 2017. We hope to run more regular services along the branch throughout 2018.